I was given the opportunity to read a beautiful book, Bessie's Pillow written by Linda B. Silbert. Published by Strong Learning, Inc. I was so excited to receive my signed copy from the author and granddaughter of "Bessie", Linda Silbert. Originally, I was going to read this at our spring homeschool co-op to our teens, this years 6-week subject is "Discovering America" & I was excited to add this twist to the usual suspects. Sadly, Life Happens. The past few weeks have been very hard on our family. We are going through some rough health issues and changes. So I am a bit late with this review but I am so glad that I picked up this book when I did. Since I didn't feel my own kiddos would understand, and I was also concerned with some of the topics touched on in this book, I chose to read it myself. What I discovered was eye-opening. Bessie, aka Boshka was a survivor. She endured things we can not even begin to fathom this day in age. So, In this hard time of my life, the Lord has used this to remind me that things could be so much worse. I really don't want to give away too many details, this book is just full of surprises and why read a book that someone has narrated. But to give you some insight, In 1906, in the country of Lithuania, at just 18 years old this young Jewish girl was more than tortured by the police who Czar incouraged them to do so. She decided to go to America and was separated from her family & home country but through it all, she succeeds far more than the odds stacked against her. 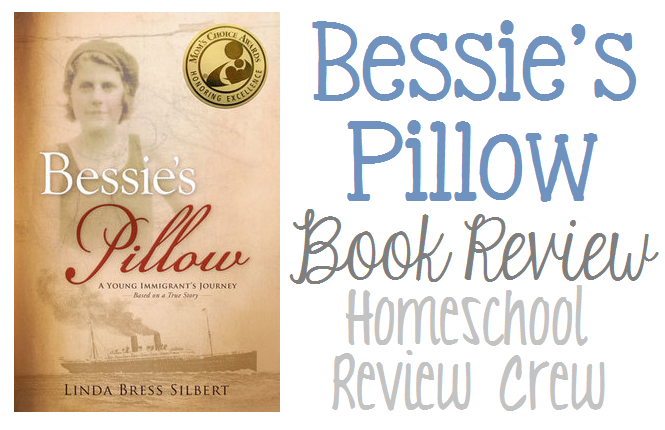 The name "Bessie's Pillow" comes from a lady she met before leaving for America, she trusted her to bring this pillow to her son, Nathan who was already in America. 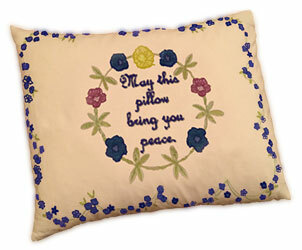 The pillow has a Yiddish phrase: May this pillow bring you peace. As you go through the story you understand the meaning and depth of this pillow and the happy ending it brings. As a woman, I was encouraged by Bessie's bravery and determination. This is one of those books where you can't put it down and makes you crave what will happen next. It will open the reader's eyes to the reality of immigration even as it stands today. 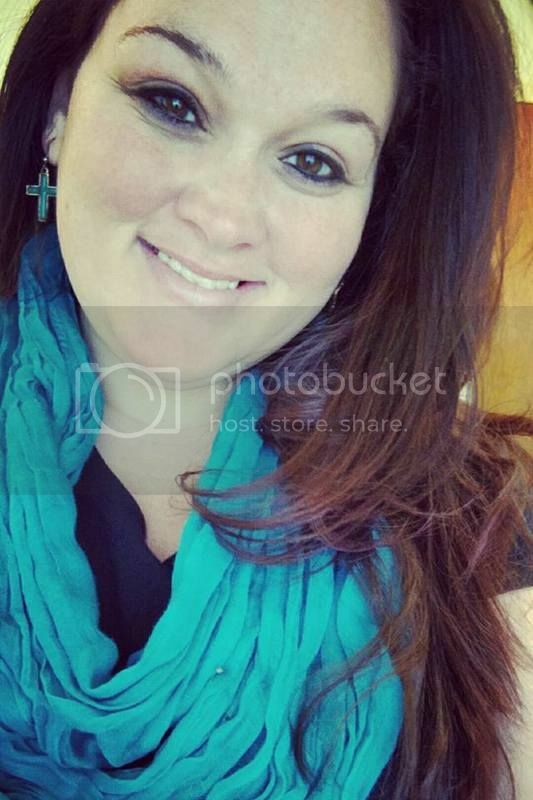 Part love story, part harsh reality but overall an amazing look into this woman's life. The author does offer wonderful free online supplements & a teachers guide packed full of additional resources and links. I believe it was very well put together. It really allows you to connect with what the characters lives were like at that time. I love looking back on old documents and petty things that may not seem like much at the time to people. So I very much appreciated these things. I look forward to using these once my kids are a little older. Some things that stuck out to me: A Look into Bessie's America this is also included in that back of the book. I really like that the author included the "Afterward" so that readers are not left wandering what happened next to the characters. Price: $15 very reasonable considering the awesome resources & teachers guide. Reading Level: 7th grade & up. Lots of advanced vocabulary words and topics. If you like historical fiction, can withstand some sadness or are studying immigration during this time period I believe this book is a home run. There were a lot of real life sorrows in this book that would be hard for little ones like mine to understand. I think teenage girls would benefit from reading this.